My sporting adventure continues this week with an adventure to Kokuritsu, known in English as the National Olympic Stadium. 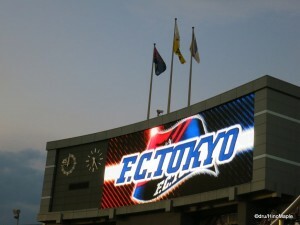 When I was looking for football games to see a few months ago, I noticed that FC Tokyo occasionally plays at Kokuritsu. It is a very old stadium that was built in 1958 in time for the Asian Games of the same year. It was a lead in sporting event before the 1964 Tokyo Olympics and the stadium has stood in Yoyogi ever since. 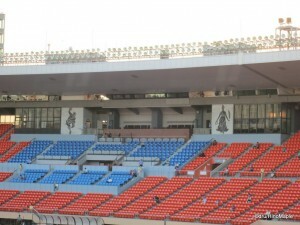 In February 2012, it was announced that the National Stadium was to be torn down and rebuilt by March 2019, in time for the Rugby World Cup in the same year. By November 2012, the final design was chosen and it looks like it will be an amazing new stadium. The current National Stadium is definitely too old; after visiting it for the first and probably last time this year, I realized how necessary it is to redevelop the current stadium. Regardless, the stadium was a lot of fun to visit and it provided me with a special way to enjoy watching an FC Tokyo game that was very unique compared to my visits to Ajinomoto Stadium. The National Olympic Stadium was built in 1958 and it has withstood the time to keep standing. It has been standing through countless earthquakes and the only reason the government wants to destroy it is to build a brand new stadium with a larger capacity. Stadiums can become iconic symbols of a city but the National Stadium has become pretty dated. From the outside, it is not an interesting piece of architecture. When I visited the National Stadium, I knew I was going to an old stadium and I was a little surprised as to how well it was maintained. The entire concourse area was well kept but it suffered a lot from a lack of stands, specifically for really large events, as well as a lack of lighting; dark is somewhat of an understatement. I would also say it was difficult to get around the stadium without bumping into people. Compared to the modern stadiums around Tokyo, the National Stadium suffers from a lack of amenities. It was built at a time when the idea of hundreds of toilets to accommodate a huge rush of fans during a half time break was unheard of. While the design is definitely dated, I was even pleasantly surprised by the gates themselves. When we look at modern stadiums, gates tend to be outside of the stadium and the entrances to the bowls are called sections. At the National Stadium, they called each entrance to the bowl a gate and each one had an iron bar gate/fence to keep people in or out. It was a nice touch for sure. The seating area is obviously dated, but it was new enough. From the looks of things, the seats must have been updated as the seats didn’t look as old as the seats in Meiji Jingu Stadium next door and the floors and walls all had a nice coat of paint. They really maintained the stadium and that is probably why it has lasted so long. You can also see a very strong Olympic theme. Under the front grandstands, I know a bowl doesn’t traditionally have a front but in many sports there is a front, there is a large building for observing the games as well as a couple Greek symbols for sport. On the opposite side was the Olympic cauldron from 1964. For the FC Tokyo VS Sagan Tosu game, they had a short ceremony to light the cauldron. All Olympic cities are allowed to keep and light their cauldrons but it isn’t lit with the official Olympic flame. 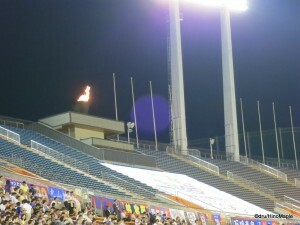 For the game, Dorompa, the FC Tokyo mascot, was given the official duty to light the flame; he lit it with a fake rod of fire, I might add. I’m sure they did this only because the 2020 Olympic city vote was held on September 7th, just a week and a half after this game. The game itself was great. FC Tokyo came out and dominated most of the game. They held possession for most of the game, from my observation, and they had more chances to shoot as well having more shots on goal. The first half was pretty tame until about 40 minutes into the first half. That is when FC Tokyo stumbled, literally. One of their players was keeping up with a forward, I believe, from Sagan Tosu and he stumbled and couldn’t keep up with him. This lead to a 2 on 1 advantage and Yohei Toyoda scored the first goal of the game. With the FC Tokyo fans unrelenting in their cheers, they continued to keep pressing their team but within 1 minute, Sagan Tosu scored again! Kei Ikeda capitalized on a sleeping FC Tokyo to put Sagan Tosu up 2 to nothing. 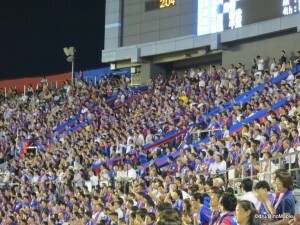 The fans were not willing to give up and they kept cheering FC Tokyo to do better and better. By the time the second half started, everyone was trying to get FC Tokyo to go. Something I noticed during the game is that in football, even in Japan, the fans are pretty loud about their distaste in the officiating as well as the opposing team if they do something wrong. There was a lot of booing, whistling, and general jibing at the opposing team. In the second half, FC Tokyo pulled something out of their hat and got 2 goals of their own within 2 minutes. Sota Hirayama and Kazuma Watanabe scored at the 82 and 84 minute mark respectively. FC Tokyo, from my observation of 2 games this season, is generally sleeping right after any kick-off. By the 85th minute, Yohei Toyoda of Sagan Tosu scored another goal and the fans were furious at the sleeping FC Tokyo. The end of the game is where things really got bad. With only a few minutes left in the game, the goal keeper for Sagan Tosu, Akihiro Hayashi went to stop the ball from an FC Tokyo shot. Hayashi fell on top of his own teammate and with an FC Tokyo player nearby, he “nursed” his back injury from his fall. He kept showing a lot of pain in his lower back for about a minute and the FC Tokyo forward, Sota Hirayama, who was pressuring the goal keeper for the last part of the game, got a yellow card. The crowd was furious over the dive. While I don’t have any replays to see if it was a real dive or not, from my angle, it was a dive. The crowd was really upset and a minute or two later when Hayashi caught another shot and fell in pain, the crowd started chanting, “liar” over and over. The actual chant starts with a couple beats of a drum followed by the crowd shouting “usotsuki” about three to five times in a row. This kept happening for the final 5 minutes of extra time and into the end of the game. Everyone was angry at the goalkeeper for “faking” an injury and decided to make it well known. I felt a little worried about the situation and finally understood why they needed to keep the crowds separated as well as station guards and volunteers around the stadium to keep people from jumping onto the field. It was a little scary at times but everyone seemed well behaved. It was the only time I had seen such anger in sports in Japan. I had seen a lot of different games but this was the first time I had seen such hostility. Even Hanshin Tigers fans, who are well known for being critical, couldn’t really match the amount of anger the FC Tokyo fans had. I’d bet it is mainly due to the culture of football but I can’t say for sure. Going to the National Olympic Stadium had been a goal of mine since they announced it would be torn down and rebuilt in 2012. I am still a little surprised that a lot of people in Japan don’t even know it is being torn down soon. I had to adjust my schedule to go to this game and I don’t regret going at all. I love going to Ajinomoto but it can be a little far for me to go there. It takes time to head across town and then out to the suburbs in the west. I prefer going somewhere closer to home but it can be difficult to find a stadium these days. 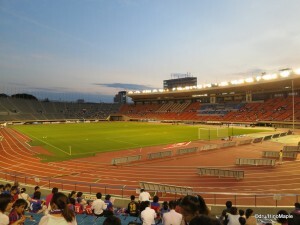 I hope that when the new National Olympic Stadium is open, they will have more games for FC Tokyo at that stadium. I’ll be more than happy to visit a game when the new stadium opens. It may lose a little of its charm as the current stadium is pretty small and interesting to see, but the new one will be better and create its own charm. This entry was posted in Football (Soccer) and tagged 1964 Tokyo Olympics, 2020 Olympic Bid, 2020 Olympics, Akihiro Hayashi, Asian Games, FC Tokyo, Football, J-league, J1, japan, Japan League, Kazuma Watanabe, Kei Ikeda, Kokuritsu, National Olympic Stadium, National Stadium, olympics, Sagan, Sagan Tosu, Soccer, Sota Hirayama, tokyo, Tokyo National Olympic Stadium, Tokyo Olympics, Tosu, Yohei Toyoda by Dru. Bookmark the permalink.